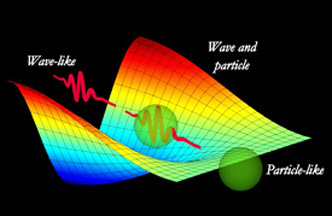 Illustration in November 2, 2012, issue of Science, depicting new research in which photons behaved as a particle or wave under forceful manipulation by scientists at detectors, but “in between the two extremes, we have states that come with reduced interference. So we have a superposition of wave and particle” at middle of illustration. Image courtesy of S. Tanzilli, CNRS. See Science journal. November 7, 2012 Albuquerque, New Mexico - Yesterday on November 6, 2012, Earthfiles reported in Headlines about the deepening mystery of photon wave-particle duality demonstrated in new British and French photon research reported in the November 2, 2012, issue of Science. Single photons were passed through an interferometer having a quantum beamsplitter at its output. In the back of the graphic, sinusoidal oscillations are observed, indicating single-photon interference, and therefore a wavelike phenomenon. In the front of the graphic, no oscillations are observed, which is the signature of particle behavior. Between these two extremes, the single photon's behavior is continuously morphed from wavelike to particlelike, indicating superposition of these two states. Thus, photons cannot be called simply either particle, or wave.